The State Bank of Vietnam (SBV)’s recent response to the continuous rise of USD prices has demonstrated its readiness to make an intervention in order to stabilise the foreign exchange market. Shortly after the US Federal Reserve (Fed) raised interest rates on June 14, greenback prices in Vietnam increased continually and even exceeded 23,000 VND per USD. Facing this fact, the central bank said it is ready to intervene to stabilizVe the market, and it has sufficient resources to do that. Evidence of this message is that the SBV Operations Center cut down the USD selling price to 23,050 VND on July 3 afternoon, 244 VND down from its morning’s rate, and 264 VND lower than the ceiling rate of the day’s reference exchange rate. With this move, eligible market members who want to purchase USD could buy this currency at lower prices from the SBV. In the past, the SBV used to decrease USD selling prices at some points of time when the exchange rate became tense, which proved effective to the market back to normal shortly after that. Likewise, this latest move of the SBV has halted the USD price surge in commercial banks. 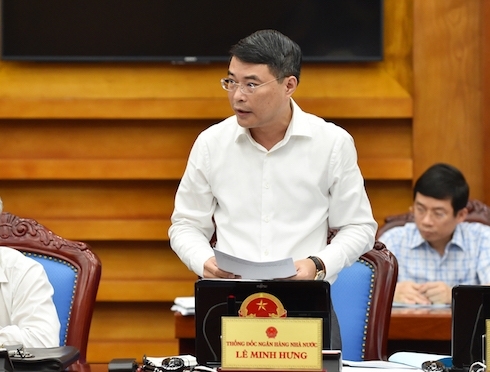 SBV Governor Le Minh Hung said the aforementioned changes in the market had been predicted by the central bank from the beginning of the year. They were mainly caused by objective factors such as the USD appreciation in the global market and the return of trade deficit in Vietnam over the last couple of months. He said the foreign exchange market remained stable as of the end of June with the VND/USD exchange rate rising by almost 1 percent in the first six months. Notably, the SBV purchased more than US$11 billion in the period, raising the foreign reserves to over US$63.5 billion. The solutions by the Government and the SBV have consolidated the trust in the VND and the stability of the foreign currency market and exchange rates, he noted. After the Fed’s sudden interest rate hike, China and the US started the “biggest trade war in economic history” when the latter imposed new tariffs on several key Chinese imports on July 6. Later, China also announced retaliatory tariffs on US goods. The trade tension between the world’s biggest economies is forecast to linger on and strongly influence their own economic situations, as well as global trade. It will also cause high pressure on the exchange rate for the remaining months of 2018. Analysts said the record foreign reserves at present are in good condition to ensure that the SBV is able to intervene in the market when necessary. Pham Thanh Ha, Director of the SBV’s Monetary Policy Department, said the central bank will keep a close watch on changes in the domestic and foreign markets, including the Fed’s interest rate hike, the US-China trade relations, movements of the European Central Bank and the Bank of Japan, and the foreign currency demand - supply balance in the domestic market, all in order to flexibly regulate the daily reference exchange rates. The SBV will continue to take concerted measures and monetary policy tools to intervene in the market, he added.